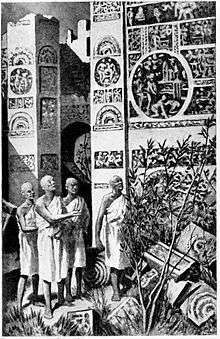 Faxian (337 – c. 422) was a Chinese Buddhist monk who travelled by foot from China to India, visiting many sacred Buddhist sites in what are now Xinjiang, Pakistan, India, Nepal, Bangladesh and Sri Lanka between 399-412 to acquire Buddhist texts. His journey is described in his important travelogue, A Record of Buddhist Kingdoms, Being an Account by the Chinese Monk Fa-Xian of his Travels in India and Ceylon in Search of the Buddhist Books of Discipline. Antiquated transliterations of his name include Fa-Hien and Fa-hsien. Faxian visited India in the early fifth century. He is said to have walked all the way from China across icy desert and rugged mountain passes. He entered India from the northwest and reached Pataliputra. He took back with him Buddhist texts and images sacred to Buddhism. Faxian's visit to India occurred during the reign of Chandragupta II. He is also renowned for his pilgrimage to Lumbini, the birthplace of Gautama Buddha (modern Nepal). Faxian claimed that demons and dragons were the original inhabitants of Sri Lanka. On Faxian's way back to China, after a two-year stay in Ceylon, a violent storm drove his ship onto an island, probably Java. After five months there, Faxian took another ship for southern China; but, again, it was blown off course and he ended up landing at Mount Lao in what is now Shandong in northern China, 30 kilometres (19 mi) east of the city of Qingdao. He spent the rest of his life translating and editing the scriptures he had collected. 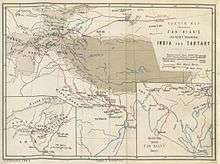 Faxian wrote a book on his travels, filled with accounts of early Buddhism, and the geography and history of numerous countries along the Silk Roads as they were, at the turn of the 5th century CE. His surname, they tell us, was Kung, and he was a native of Wu-yang in P’ing-Yang, which is still the name of a large department in Shan-hsi. He had three brothers older than himself; but when they all died before shedding their first teeth, his father devoted him to the service of the Buddhist society, and had him entered as a Sramanera, still keeping him at home in the family. The little fellow fell dangerously ill, and the father sent him to the monastery, where he soon got well and refused to return to his parents. When he was ten years old, his father died; and an uncle, considering the widowed solitariness and helplessness of the mother, urged him to renounce the monastic life, and return to her, but the boy replied, "I did not quit the family in compliance with my father’s wishes, but because I wished to be far from the dust and vulgar ways of life. This is why I chose monkhood." The uncle approved of his words and gave over urging him. When his mother also died, it appeared how great had been the affection for her of his fine nature; but after her burial he returned to the monastery. On one occasion he was cutting rice with a score or two of his fellow-disciples, when some hungry thieves came upon them to take away their grain by force. The other Sramaneras all fled, but our young hero stood his ground, and said to the thieves, "If you must have the grain, take what you please. But, Sirs, it was your former neglect of charity which brought you to your present state of destitution; and now, again, you wish to rob others. I am afraid that in the coming ages you will have still greater poverty and distress;—I am sorry for you beforehand." With these words he followed his companions into the monastery, while the thieves left the grain and went away, all the monks, of whom there were several hundred, doing homage to his conduct and courage. When he had finished his noviciate and taken on him the obligations of the full Buddhist orders, his earnest courage, clear intelligence, and strict regulation of his demeanour were conspicuous; and soon after, he undertook his journey to India in search of complete copies of the [Vinaya-pitaka]. What follows this is merely an account of his travels in India and return to China by sea, condensed from his own narrative, with the addition of some marvelous incidents that happened to him, on his visit to the Vulture Peak near Rajagriha. It is said in the end that after his return to China, he went to the capital (evidently Nanking), and there, along with the Indian Sramana Buddha-bhadra, executed translations of some of the works which he had obtained in India; and that before he had done all that he wished to do in this way, he removed to King-chow (in the present Hoo-pih), and died in the monastery of Sin, at the age of eighty-eight, to the great sorrow of all who knew him. It is added that there is another larger work giving an account of his travels in various countries. Such is all the information given about our author, beyond what he himself has told us. Fa-hien was his clerical name, and means "Illustrious in the Law," or "Illustrious master of the Law." The Shih which often precedes it is an abbreviation of the name of Buddha as Sakyamuni, "the Sakya, mighty in Love, dwelling in Seclusion and Silence," and may be taken as equivalent to Buddhist. It is sometimes said to have belonged to "the eastern Tsin dynasty" (A.D. 317-419), and sometimes to "the Sung," that is, the Sung dynasty of the House of Liu (A.D. 420-478). If he became a full monk at the age.... of twenty, and went to India when he was twenty-five, his long life may have been divided pretty equally between the two dynasties. Faxian (1886). A Record of Buddhistic Kingdoms; being an account by the Chinese monk Fa-Hien of his travels in India and Ceylon, A.D. 399-414, in search of the Buddhist books of discipline. James Legge (trans.). The Clarendon Press, Oxford. Faxian (1877). Record of the Buddhistic Kingdoms. Herbert A Giles (trans.). Trubner & Co., London. Beal, Samuel. 1884. Si-Yu-Ki: Buddhist Records of the Western World, by Hiuen Tsiang. 2 vols. Translated by Samuel Beal. London. 1884. Reprint: Delhi. Oriental Books Reprint Corporation. 1969. (Also contains a translation of Faxian's book on pp. xxiii-lxxxiii).